It’s that time of year again! Storm season has arrived which means we’re all stepping foot out of hibernation to inspect what kind of storm damage repairs we’re facing. 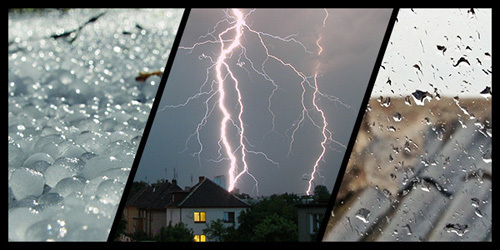 Do you know what to look for after a catastrophic hail or wind storm hits your area? Here are a few tips to help you decide to call Joshua Miller Roofing for a Free Property Inspection to inspect for Hail Damage and Wind Damage. Wind Damage is the most obvious type of storm damage to identify. However, typically are an excellent indicator of storm damage repairs needed. 1. MISSING SHINGLES: If you see missing shingles on your roof, it’s an obvious indicator that you need storm damage repairs. 2. ROOF MATERIAL ON THE GROUND: Finding shingles on the ground may indicate parts of your roof have been blown off by wind. Many times you can’t even if you can’t see it from the ground! 3. BLOWN OFF EXTERIOR COMPONENTS: Blown off fascia, siding, gutters or other exterior components are all indicators of wind damage also that may need storm damage repair. Hail dings on your car. This may seem like an odd place to look for evidence of hail damage to your home, but it’s actually one of the most effective and obvious. In order for hail to damage most cars, the hail must be a certain size and density. That size and density reflected in the hail damage to your car, would most likely indicate the hail was large enough to damage your roof, as well. That is, assuming your car was at your home or property, at the time of the catastrophic event. Hail dimples on gutters, downspouts, fascia, window wraps and other soft metal accessories on your home (Aluminum, copper, etc.). Soft metal accessories are easier to damage than other exterior components, and offer insight in to hail large the hail was at your property during the storm. Larger hail hits to your soft metals certainly warrant further inspection of the roof and property. Hail indentations to the fins on your A/C unit. Older A/C units and window A/C units typically have exposed A/C fins. If hail came in from the direction the A/C unit faces, the A/C fins on the unit would be peppered with indentations from hail impacts. This is additional collateral damage, or supporting evidence, and further support the decision to call for a property inspections from one of our Haag Engineering Certified Inspectors. Massive granule loss from your shingles is a fair indicator of hail damage to your property. You may notice grains of asphalt rock on your back deck, or driveway, or coming out of your downspouts after a storm. Shingles are designed to lose granules during inclement weather, but when an abundance of granules comes off during a weather event, it’s better to be safe and have your roof inspected for further insight. Hail damage to your window screens. Most window screens have a certain pliability to them and can withstand a certain amount of debris impact. But when a hail stone hits your screens at a certain velocity, it will puncture your screen and leave it peppered with holes. You may only see damage to your screens on certain sides of your house, depending on the direction the storm traveled and the amount of blowing winds. Your neighbors are all getting new roofs and other major storm damage repairs! If you step out your front door one morning, or come home from work one evening and see your neighbors getting a new roof, or have solicitors knocking on your door to sell you the promise of a new roof, politely tell them, “No thank you!” Then call your trusted insurance restoration specialists at Joshua Miller Roofing for a complete property assessment and inspection. Neighboritis, as we affectionately call this phenomena, is typically the largest influence on a homeowner’s decision to get their roof inspected by a trained specialist. It’s hard to see ALL your neighbors getting new roofs and think that you wouldn’t either. ALL of these tips on what to look for will help you decide on whether or not to have your property inspected for necessary storm damage repairs needs. Not all of these must be found to warrant calling for an inspection, but even finding one is an excellent reason to have your home looked at. Besides, it’s FREE! Don’t trust just any company with your home. Be sure to verify the reviews and ratings for any contractor your are considering to hire. Here is a link to a HomeAdvisor article about Hail Damage and other storm damage. You can find ratings and reviews for Joshua Miller Roofing & Contracting there as well. Do your homework and then call us today! Once a certified hail and wind inspector looks at your property, we will show you pictures of any damage we found, and give you an honest assessment of the damage to your property. If one of our inspectors, or sales representatives, finds sufficient damage, he or she will then instruct you on how to proceed. If one of our inspectors DOESN’T find sufficient damage, he or she will explain their assessment to you and how to best move forward with any repairs or maintenance. We wouldn’t want anyone to waste our time, and we certainly won’t waste yours!